Back in 2014, when Live Simply was just a few months old, I shared a recipe for homemade toothpaste. 1. Delete the original post, and use the same name for the new post. <–That would be similar to riping a page out of a personal journal. 2. Come up with a new recipe name. <–And possibly confuse future readers. I decided to take a little inspiration from Apple (i.e. 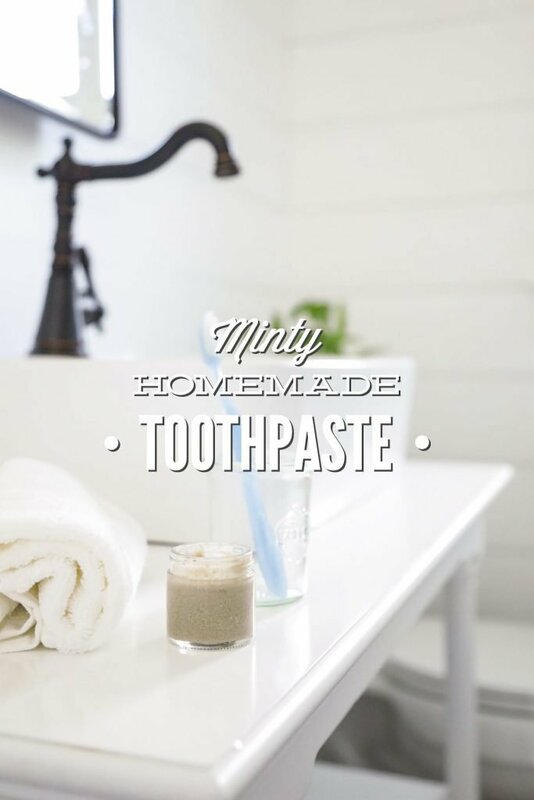 iPhone 3,4,5,6,7…), and named today’s recipe, Minty Homemade Toothpaste 2.0. The biggest difference between my original recipe and today’s recipe is the amount of toothpaste that’s made. When I first started making body products, I felt the need to go big. Meaning, I felt like recipes should make a lot of product. Over the years, I’ve changed my thinking. Now, I tend to focus on making smaller batches of homemade products to keep the ingredients fresh and the products safe. Balms and butters (recipes that rely solely on butters, oils, beeswax, and sometimes essential oils) are the exception to this rule. 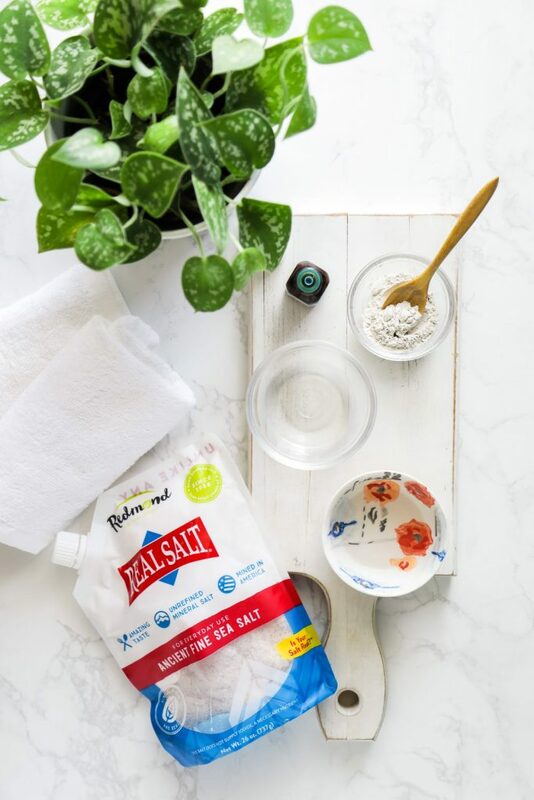 Smaller batch products are used quickly (they don’t sit around for a year in a medicine cabinet), so they’re made often (reducing any risk of spoilage). I know, this sounds time consuming, but it isn’t. At this point, I only make a few body products at home since there are quite a few quality products on the market, and the products I still make are incredibly easy to whisk together. Currently, I make today’s toothpaste recipe, a clay facial mask, a facial exfoliator, and a face moisturizer. That’s pretty much it at the moment (other than the occasional vapor rub and boo-boo cream). For the rest of our needs, I purchase trusted products from the store or market. <–That’s what simple, natural living looks like for me at the moment. 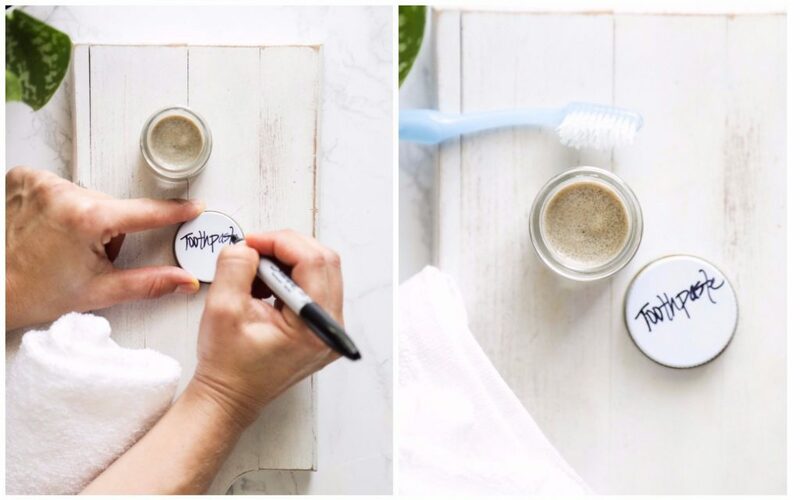 My original toothpaste recipe was inspired by Earthpaste, which a few years ago was one of the only non-toxic toothpaste options on the market. Since 2014, natural toothpaste options have increased. Today’s new and improved recipe is based on trying these newer products, along with testing out some of the homemade samplings from the vendors at the local market. In this improved recipe, clay (a cleansing, detoxifying ingredient) and coconut oil (antibacterial) are used to clean the teeth. Distilled water is added to thin the toothpaste and keep it from tasting like a skillet smothered in coconut oil. 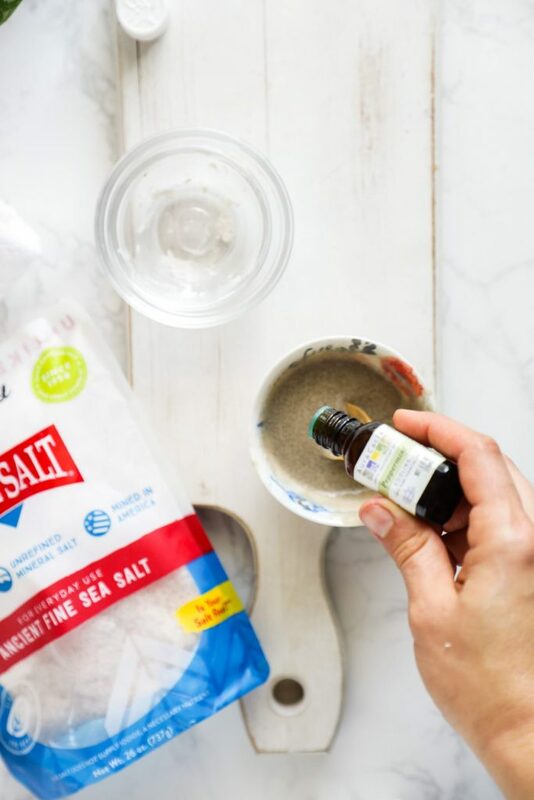 Salt is added for the minerals and cleansing benefits, and the peppermint and tea tree essential oils are added for antibacterial properties. Unlike my original recipe, this toothpaste isn’t super salty–which was a big turn off for a lot of folks (including my hubby). I get it, no one wants to feel like they’re brushing their teeth with a salt shaker. I personally love the taste of this new and improved version. The fresh, minty taste is refreshing and my teeth always feel so clean after brushing. 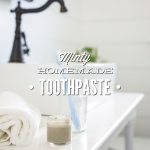 Before I share the recipe, let me just say that I realize that not everyone wants to use homemade toothpaste (that includes my hubby and kids). 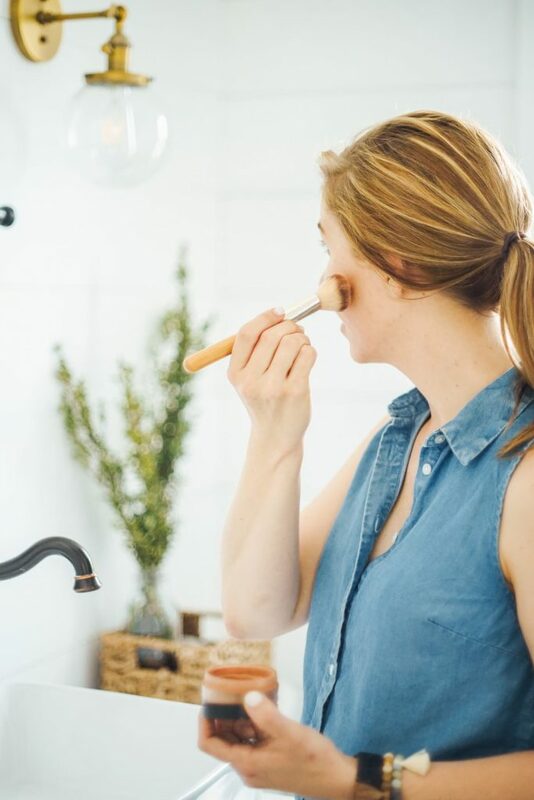 Maybe you have your doubts about how effective it is, or you don’t like the idea of brushing your teeth with oil or clay, or you’re just not ready to go that hippie (yet). Or, maybe you just love squeezing your paste from a bottle featuring printed words. Friend, I completely understand! 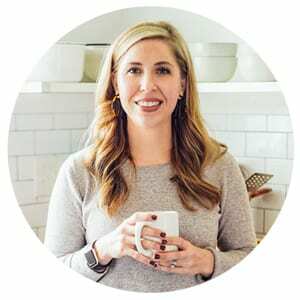 The do-it-yourself recipes shared on Live Simply are, for the most part, the recipes I’m using (or have used) on my own body. I share the recipes to chronicle what I’m making and loving, and also to show others just how easy it is to make some products at home. You don’t have to make toothpaste in your kitchen in order to live a natural lifestyle. There are quite a few non-toxic toothpaste options on the market today, ranging from clay-based pastes (like Uncle Harry’s and Earthpaste) to more Crest-like toothpastes (some of the Tom’s products rank well on the EWG website and Dr. Bronner’s). In a few weeks, I’m going to share a round-up of my favorite natural toothpaste options. 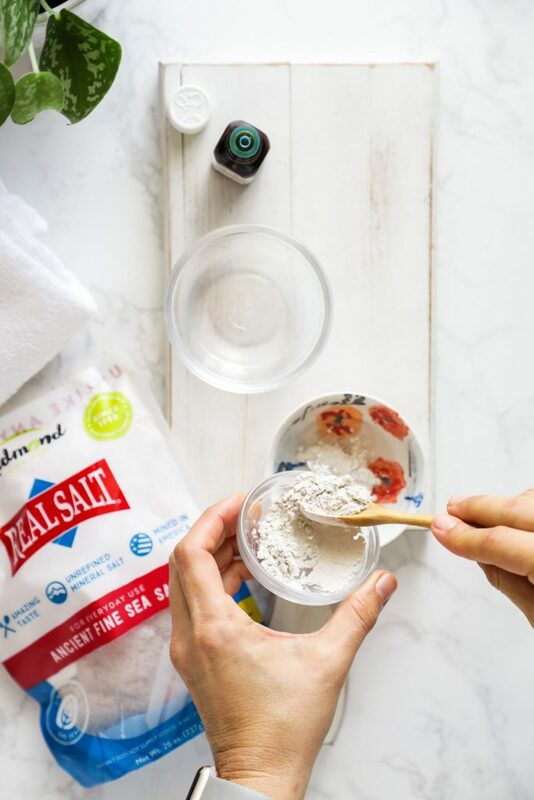 In this recipe, clay is used to clean teeth, along with coconut oil (antibacterial), distilled water (to thin the toothpaste), peppermint and tea tree essential oils (antibacterial), and a bit of salt. Add the clay, distilled water, melted coconut oil, salt, and essential oils to a small, non-metallic mixing bowl. Stir to combine the ingredients. Spoon the toothpaste into a small storage jar. Seal the jar. Store the toothpaste in the fridge between uses*. Scoop a small amount from the jar onto your toothbrush. You can use your toothbrush to do this, or a small utensil. Brush as normal, spit, and rinse. *This is a very small batch recipe--making enough to last just a couple of weeks. Keeping the toothpaste in the fridge does cause it to clump (due to the coconut oil). I personally don't have an issue with this. Do what you're most comfortable with--keeping the toothpaste on your counter, or in the fridge. Feel free to decrease the salt amount to 1/4 teaspoon if you feel it's too salty. The toothpaste will be runny, but it will firm up in the fridge or a cooler home. If you want a thicker paste, you're welcome to add more clay, adding just a few pinches until you reach the desired consistency. If it's too thick, which can happen in a cold environment, add a splash (or two) of warm/hot water to the paste and stir. As with any toothpaste, this isn't meant to be swallowed. 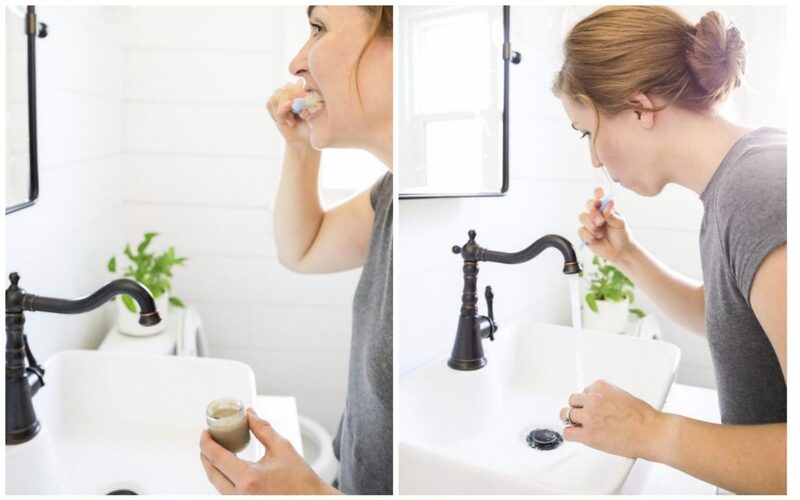 Want to make the transition to non-toxic toothpaste, but don't want to go the homemade route? No problem! Here are my favorite (store-bought) toothpaste options. This sounds really nice. I just started using a store bought toothpowder and I’m pretty disappointed with it because it doesn’t have any minty-ness to it and it doesn’t leave my mouth feeling all that fresh, though it does clean my teeth. I like the idea of this recipe because it doesn’t seem to be a powder, and the powder I’m using makes such a mess everywhere. Love your recipes! Can I ask why you omitted the baking soda in this recipe? Hey Qudsiyah Remtulla, Thank you! It’s too salty for some folks, and can be a bit too abrasive for some, too. You could add a bit if you’d like. I’ve never made homemade toothpaste before, so this is going to be a fun adventure. Thanks for sharing the details! Kristen thank so for sharing thins this recipe. It’s on my list to make soon. I was wondering why you store it in the fridge. That seems very inconvenient. Hey Ashley, I’m just concerned about the water in the product and folks (like me ;)) dipping their toothbrush in the paste. If your home is cooler and you use a popsicle stick or utensil to scoop the paste, you can most likely store it at room temperature without issue. I’ve found that it’s pretty easy to grab it from the fridge, so that’s what I’ve continued to do to extend the life of the product. You could always skip the water completely, too, and sub in more coconut oil. Is there any concern with the coconut oil clogging up the sink pipes? I know when you oil pull they say not to spit it into the sink. Hey Cathy, I haven’t had issue. My thinking is that there’s very little coconut oil in this recipe (and very little to spit out if using a small amount), so it may not be an issue. But, I also don’t live in a cold climate where the oil could solidify. You could definitely spit it out in the trash to be safe. Absolutely love this!!! I had my doubts about straying from my minty fresh store bought toothpaste, but love this. The subtle salty flavour is suprisingly yum and there is just enough peppermint for me to not balk when i am daydreaming while brushing after become accustomed to the minty taste after 20 years of using store bought mint toothpaste. My teeth feel super clean and I am finding using a fresh small butter knife is the easiest way to get it onto my toothbrush every day without worrying about mouth germs contaminating the jar. Thank you for another great recipe to include in my natural bathroom. Hi Kristin, thank you so much for the recipe. also I keep having doubts about straying from fluoride toothpaste, have you had any problems with your teeth since switching?? Thanks again for your website and all the info you provide! Hey Kate, You could try kaolin clay. It can interact with metal. I know Primal Pit Paste makes their toothpowder with this clay. After my research, I personally stay away from synthetic fluoride in toothpaste (Google, synthetic versus natural fluoride for more information). I recommend doing your research and doing what you feel most comfortable. There are definitely two sides to this debate. mine is a lot darker than yours in the picture its a darker green is that ok? Hey Ali, Yes, it’s probably due to the color of the clay. Ok awesome Thank you! Is all bentonite different colors? I bought the one you recommended with the first recipe and it expires at the end of this year, would I still be able to use it and it be as effective after the expiration date? Hey Ali, It can vary slightly, but most of the time bentonite will be a grayish-greenish color. I would try to use the clay before the expiration. It’s great for face masks, too. Hi. I am considering making my own toothpaste but all the recipes I have seen are different. some say I should add baking soda, hydrogen peroxide and bentonite clay. 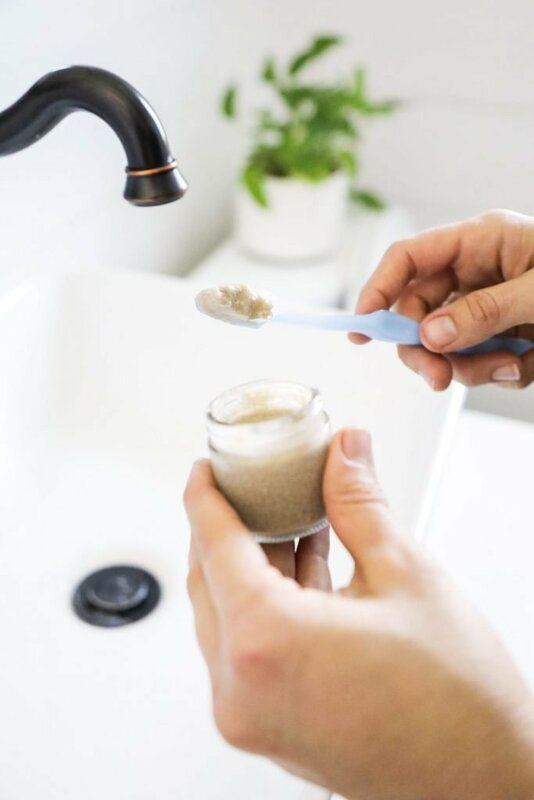 Is bentonite clay the main ingredient to keep teeth clean and protected or should I add other ingredients just to be sure? Hey Tramaine, Everyone has their own spin on toothpaste. I like the clay since it draws out impurities and dirt. I love making homemade toothpaste. The only problem I have had is that when it gets warm, the coconut oil melts and I end up with a drippy and oily mess. Any ideas for how to deal with this? Hey Kimberly, You could keep in the fridge. That’s how I store my toothpaste since we live in Florida. I just wanted to say your toothpaste was a big hit… with my wife’s co-workers. I made the toothpaste, was loving using it and keep it in my kitchen apothecary. My wife took my homemade cinnamon rolls to work and thinking that it was the goat cheese frosting (which was in the fridge) took the toothpaste to work and slathered it all on her and her co-worker’s rolls! They were trying to figure out why it tasted so funny! I didn’t realize until I went to brush my teeth and saw that it was gone, but the frosting was still in the fridge. BAHAHAHAHAHAHA!!!!! !